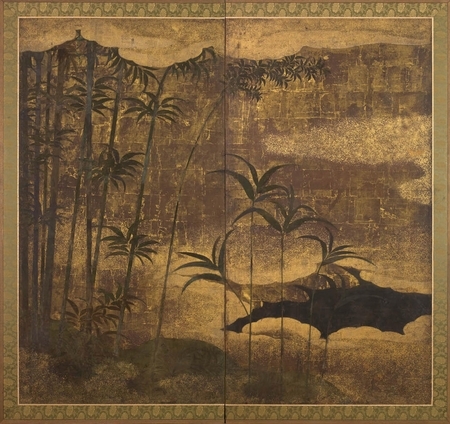 6661	A two-fold paper screen painted in ink and colour on a gold and sunago (sprinkled gold) ground with take (bamboo) in a river landscape. A cluster of malachite green bamboo stalks stand upright in the left of the composition, with a single stem bending over to the right, drawing the eye to the smaller group of young bamboo which stand in the foreground. Squares of gold leaf lend a warm glow to the areas of sky and ground, whilst shimmering gold dust adds highlights to the soft clouds of mist which sit both in front and behind the bamboo. Through a small parting in the clouds, the edge of a rocky outcrop can be seen reaching into the dark waters of a stream. Take (bamboo) represents strength, vitality and survival through adversity due to its delicate structure that bends in the wind, but never breaks. It has been known as one of the Shochikubai (Three Friends of Winter) since the 13th century in China, along with the plum and the pine, each symbolizing perseverance and integrity as they survive the winter without withering. 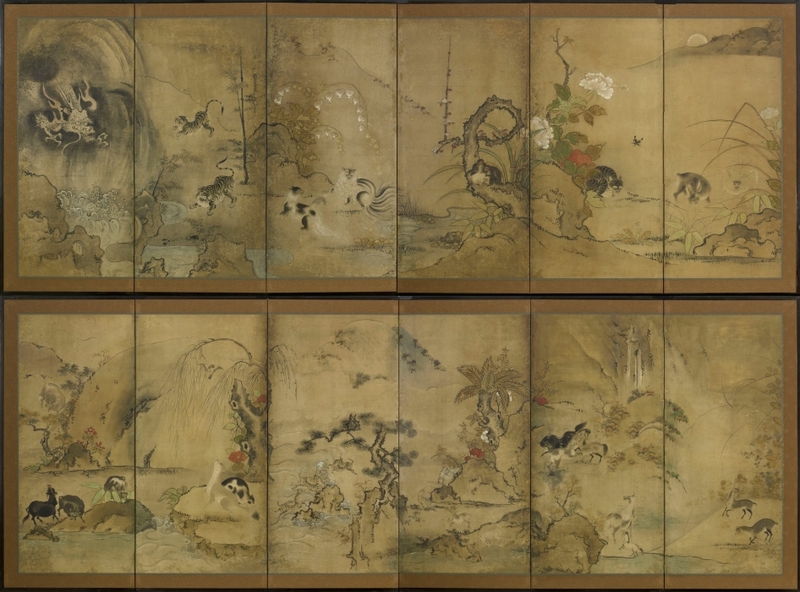 For a similar example see: Sequel to Masterpieces of Folding Screens of the Momoyama period through the Meiji era. pp. 62-63, pl. 33. SKU: 6661. Categories: Screens, Two Fold.